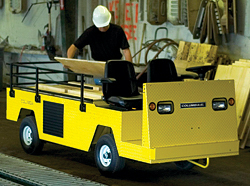 The Payloader series of Burden Carriers is designed to carry loads up to 5,200 pounds and tow up to 14,000 pounds. The vehicle is 100 percent electric, and its chassis is made of 14-gauge, diamond-plate steel with 10-gauge support sections. The unit features front and rear steel bumpers, dual head and taillights, and adjustable bucket seats. Two models with different cargo-deck sizes and wheelbases are available.